Is your Access Database 2016 performance gets degraded when multiple users share the database over a network? Well know you need not to suffer with this as you can easily resolve this issue. Wants to know? 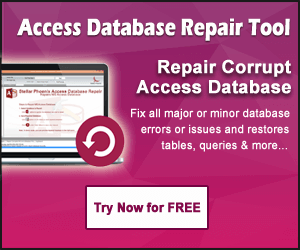 Then keep reading this post as this will help you in resolving this Access database issues with the most appropriate solution. Without wasting any more time let’s discuss, what’s the solution is….? 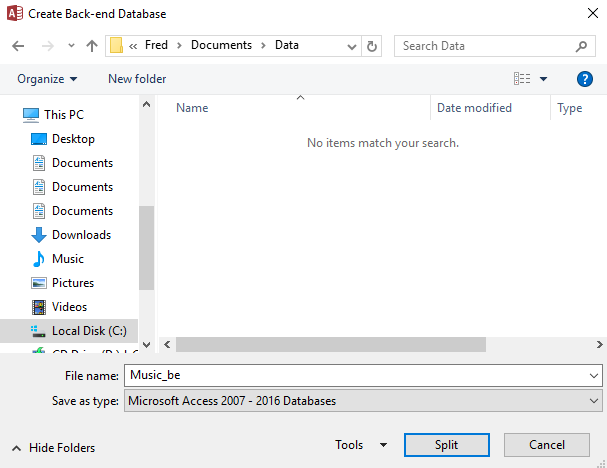 Well this issue can be resolved easily by Splitting The Access 2016 Database. As splitting the database involves separating the data from the rest of the database. Thus, the performance of your database won’t get affected over the network even though multiple users are working on it. 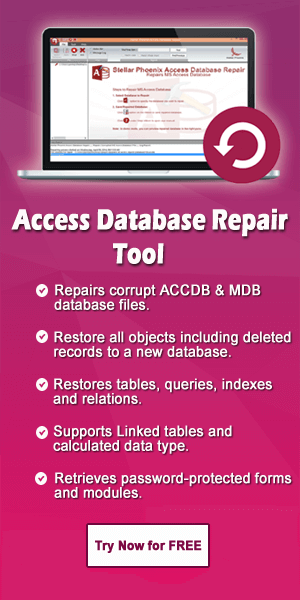 Why Splitting The Access Database Is Important? The multi-user environment has its own challenges. Access is often used as an ad hoc development tool by people outside the I.T department to design needed solution. 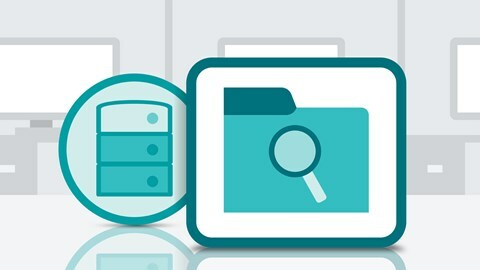 These applications can end up being used by several users across a company which means multiple users accessing the same database file at the same time. So, it’s obvious that the performance of the application to degrade pretty quickly when multiple users access the same Access database file. Therefore, splitting an Access database is essential when sharing the database via internal network. Splitting Access Database not only improve the performance but also reduces the chances of the Access database file to get corrupt because several users accessing it at the same portion of time. 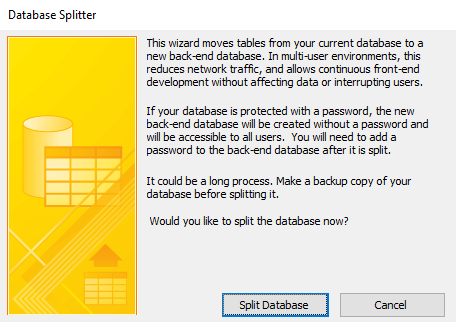 Splitting a database involves separating the database into two files. One file is the back end database which contains all the tables and data. The second one is the front-end database that contains all other objects like, queries, reports and forms. Users work with local copy of front end database and data is retrieve/sent from the back end database. 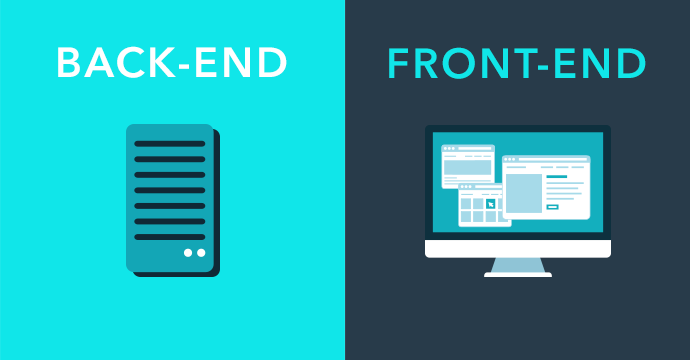 Thus it means there are several copies of the front end database to get easily distributed with multiple users but only one copy of the back end. In this way, only the data needs to be sent across the network. But in case of non-split database, all database objects need to be sent across the network that typically results in the slow working experience for the user. Significantly helps to improve the performance of the database because only the data is sent across the network. As in the non-spilit database, the database objects themselves — tables, queries, forms, reports, macros and modules etc. are sent across the network, not only the data. As only the data is sent across the network, database transactions such as editing of the records are completed more quickly, which makes the data much available to edit. If you are storing the back-end database on the system that uses the NTFS file system then you can use the NTFS security feature to encrypt your data. As users access the back end database by using linked tables, then the chances are automatically gets lesser that intruders can obtain the unauthorized access to the data by stealing the front end database or by posing as an authorized user. 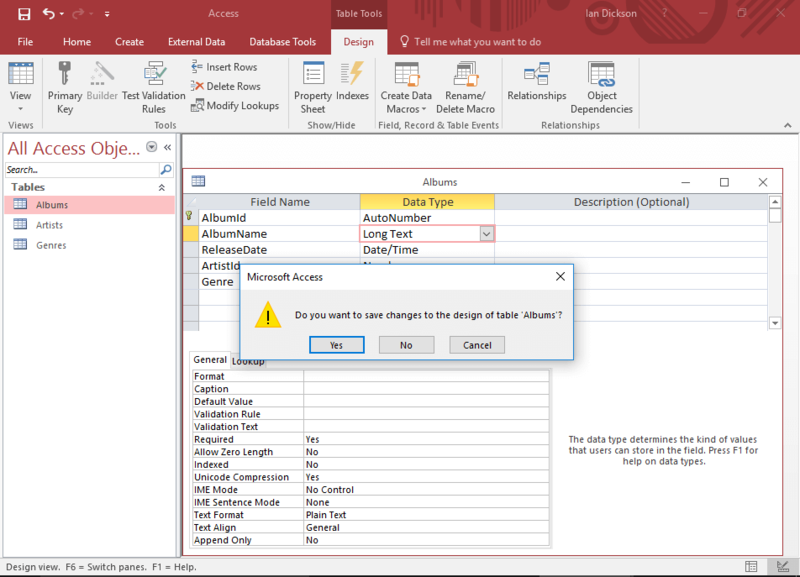 So start learning How To Split Access Database 2016. But before start doing this, keep a proper backup of your database. As this will help you later in easy restoration of database to its pre-split sate in case you need not to split the database for any reason. To launch the database splitter wizard firstly you need to check that the Database Tools tab is open on the ribbon. 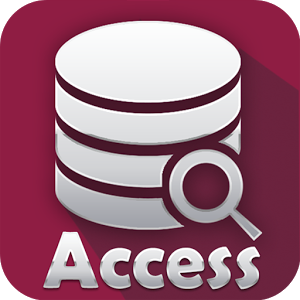 Now click the Access Database option present in the Move Data section. 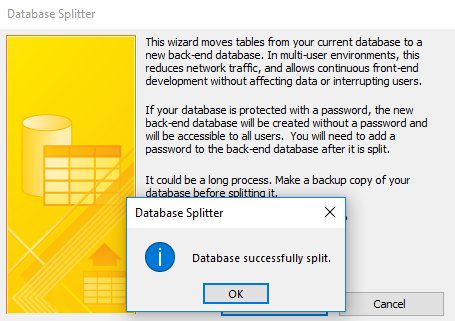 Click to Split Database option. Select a name and location for the data filer and click to the split option. It’s better to leave the name as suggested by the access itself i.e with the _be suffix. As the first part of the name is taken from the original database file which is used by front-end database and the _be suffix indicates its back-end database. 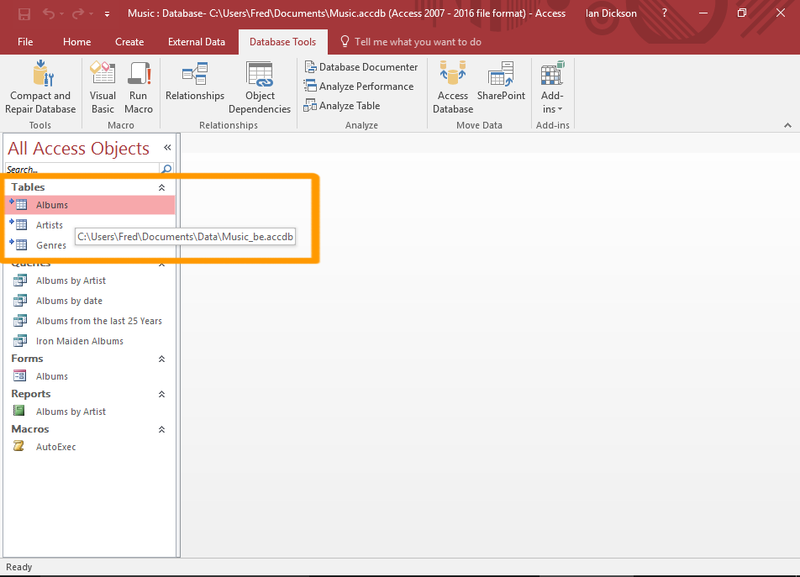 Don’t make any changes to the file type unless someone needs to use the file type with an earlier version of access that doesn’t support the current file type. After splitting up your database you will get a conformation message. At last click to the OK option. You can easily check out that the split took place correctly or not, by opening both the database files. Firstly open the original database. 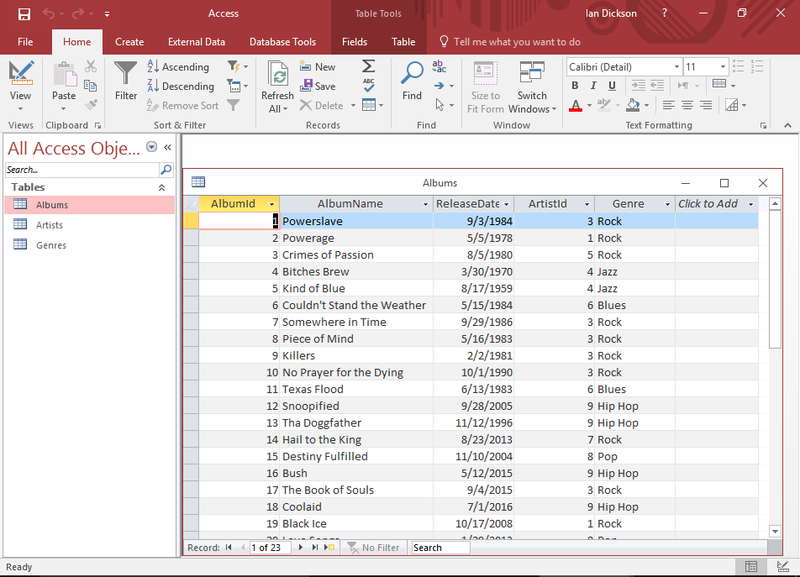 In this tutorial our original database is Music.accdb file. In the front end database, in the left navigation pane, the table names will be prefixed with a small arrow sign. So if you take the mouse cursor over it, you will see the location of the data file. if you open them in design view, you will be asked that you can only do that from the back end database. In the front end database, if you try to open a table in Design View then you will be asked that you can only do modification from the back-end database. In this back-end database all the data is kept down. It uses the new database file that we created (Music_be.accdb). 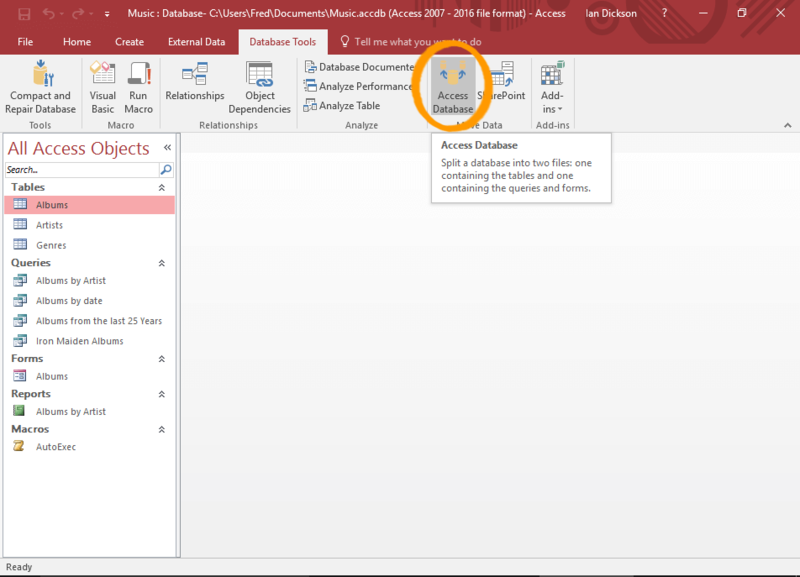 You will observe that only the tables are displayed in the left navigation pane. None of the objects are displayed. That’s the reason that all the other objects are in the front-end database. By opening the table you can still view all the data present in Datasheet View. In the back-end database, you can view the table in design view and make updates to data types, properties etc. Now you must have got an easy idea on how to split the Access Database 2016 into front-end and back-end. Moreover, how such splitting of database is beneficial.